Several very late nights or should I say "early mornings" have enabled me to break the back of the PDF statistic card generation process for the 15mm SCI-FI miniatures game Grunts. I now have a process where I can rapidly automate generation of cards which has been worth the work. Previously I had kept a different master card image for each type of unit in Grunts which include Tanks, Support Vehicles, Air Support Vehicles, Mecha, Grunts, Specialists, Commanders and Monsters (Think B-Movie Epic Monsters). I now have one master card template for all unit types in the game. 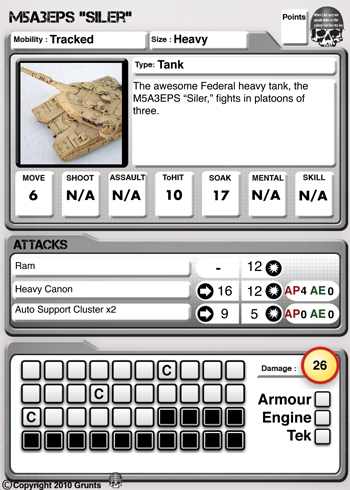 The card pictured is the new Khurasan Siler Heavy tank and I have to admit I made a mistake on the design. It has a plasma canon and not a traditional projectile canon, so the next update will have these details adjusted. 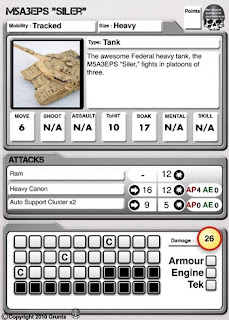 15mm SCI-FI Vehicles in Grunts (Tanks, Support and Air) have multiple damage blocks, presented in a grid. The heavier the vehicle, the more damage blocks they have, with the heaviest hull being "Assault Class" and tanks naturally have the most damage taking potential in each class. When you take weapons fire over your models "Soak" statistic you start to mark off these damage blocks. When you mark a damage block with a "C" in it you need to take a critical threshold check to confirm if one of the internal systems has been damaged which are Armour, Engine and Tek. If you lose one of these systems on the threshold check your vehicle will be impaired depending on the disabled system. The vehicle is still capable of battle actions but will be at a negative modifier (detailed in the rules). These damage rules allow for some fun play with a chance that you could impair vital systems before the vehicle is destroyed after all damage blocks are finally filled. Grunts 15mm SCI-FI also includes rules for combat mechanics which can offer quick field repairs for vehicles, extending their life in the field.